Who said it: Mark Twain or Clarence Darrow? | When I Survey . . .
Who said it: Mark Twain or Clarence Darrow? I said it was by Clarence Darrow, but my sister-in-law just informed me that it has been winging its way around Facebook as being by Mark Twain. This entry was posted in Mark Twain. Bookmark the permalink. ← Check out Darkwood Brew: Who knew a mainline congregation could do high-quality online programming? >Rick, I believe that you were correct the first time. The words are recorded in Darrow's The Story of My Life (1932): 'All men have an emotion to kill; when they strongly dislike some one they involuntarily wish he was dead. I have never killed any one, but I have read some obituary notices with great satisfaction' (p. 86 in the 1960 edition published by C. Scribner's Sons). >Thanks, Jason. So yet another example of the Internet, so helpful in many ways, spreading misinformation. I think the NYT obit cited it as Twain, but perhaps in this poor economy they have fired their fact-checker. 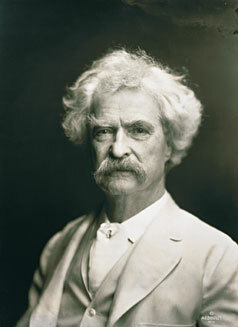 >It seems that Twain is almost as often mis-cited as is Martin Luther King Jr.